I was inspired by this Martha Stewart photo (on my Inspiration board on Pinterest), and I flipped the sketch right over so that I could use the idea of the hanging hearts. I achieved depth and different colours by using generational stamping (stamping again without re-inking the stamp). 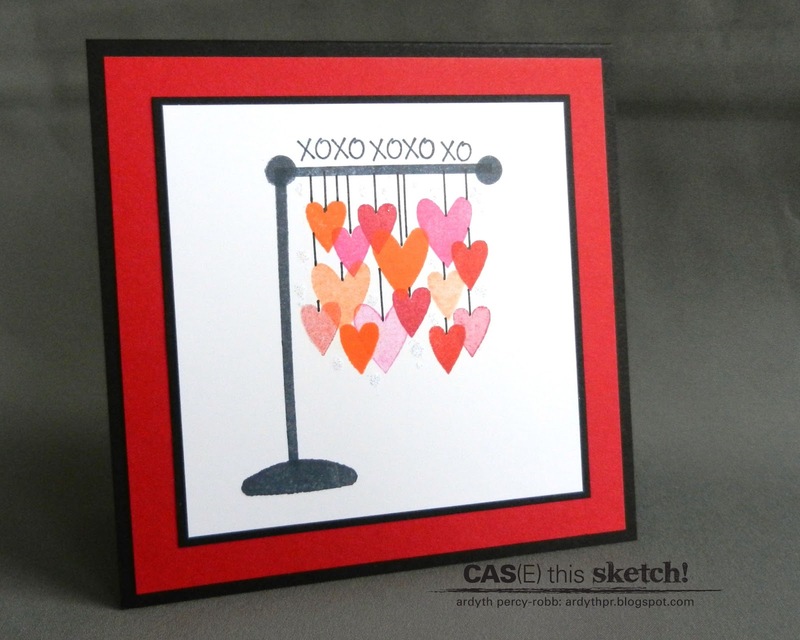 My sort-of sentiment is a line of hugs and kisses from The Stamps of Life. I used an Impress 'shape', Papertrey's Faux Ribbon and a small circle and two elongated hearts to build my Sign of Love. Now it's your turn - I can't wait to see where this sketch will take you - the Design Team has some amazing examples - take a look and then link up your creation before the deadline - next Tuesday at noon! Oh my goodness Ardyth, this is fantastic! I LOVE what you came up with based on that inspiration photo. Very clever indeed! What a perfect combination of inspiration photo and sketch! Your card is sooo sweet! You rocked the sketch...and have I told you when I look at your Pins I think to myself...can't wait to see how she'll interpret that...you eye for graphics and color leaves me in awe. There is SO much depth! I figured you were doing a bunch of masking and that is NOT simple - but your generational stamping worked perfectly!! Oh, this is just TOO clever! Love love love your take on this sketch and these colours together... perfect! Stop it! This is flippin ridiculous, it's so perfect!! Oh, this is so clever! I love those hanging hearts on the frame. I am still stuck with that tree...and look what you did! Love how you flipped the sketch and the overlapping hearts are so cool! This is such a cool card! I love the hearts and colors!